The Unitary Wheel Cassette (UWC) Series is a drop-in replacement for polymer desiccant wheels in most unitary ERV brands. 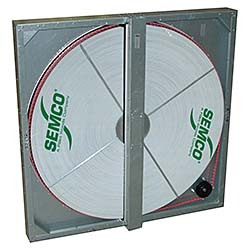 Uses 3 3⁄4-inch-wide wheels that feature a fast-acting, corrosion-resistant desiccant that&apos;s applied to an all-aluminum wheel substrate. The wheel&apos;s honeycomb matrix&apos;s fluted opening design produces maximum latent and sensible air-to-air heat transfer, but generates up to 50-percent less HVAC system static pressure than polymer film wheels.